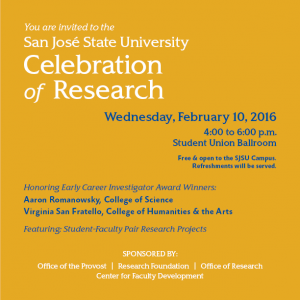 Students, staff, faculty and members of the public are invited to the SJSU Celebration of Research on Wednesday, Feb. 10, from 4-6 p.m. in the Student Union Ballroom. This year’s event will feature presentations from the 2015 Early Career Investigator Award Winners Aaron Romanowsky and Virginia San Fratello. 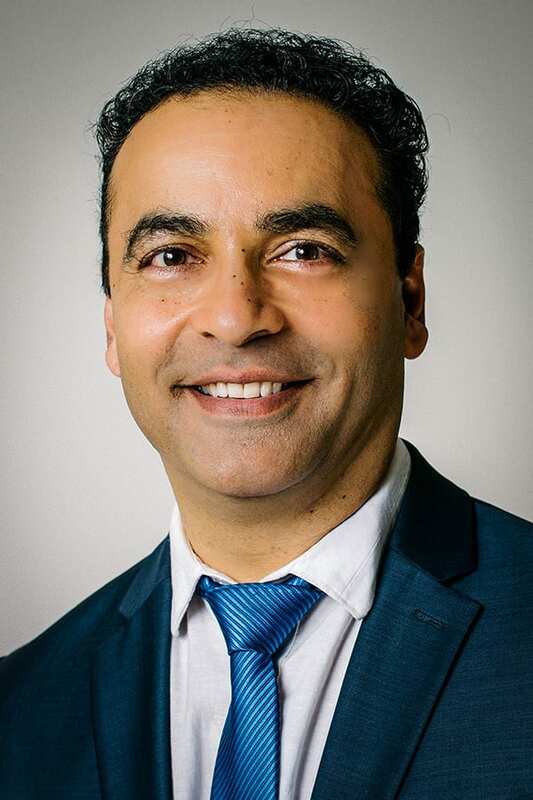 An assistant professor in the College of Science’s physics and astronomy department, Romanowsky has produced 47 refereed publications in journals such as “The Astrophysical Journal” and recently received $40,718 from the National Science Foundation to continue his research. He and his students are credited with discovering a hypercompact cluster, or one of the densest galaxies. An assistant professor in the College of Humanities and the Arts design department, San Fratello has successfully secured funding for her work that includes materials and fabrication processes, including 3-D printing. She recently received a $90,000 grant from the United States Environmental Protection Agency. San Fratello is an active architect who is working with manufacturers and distributors to launch innovative and sustainable building components into the market place. 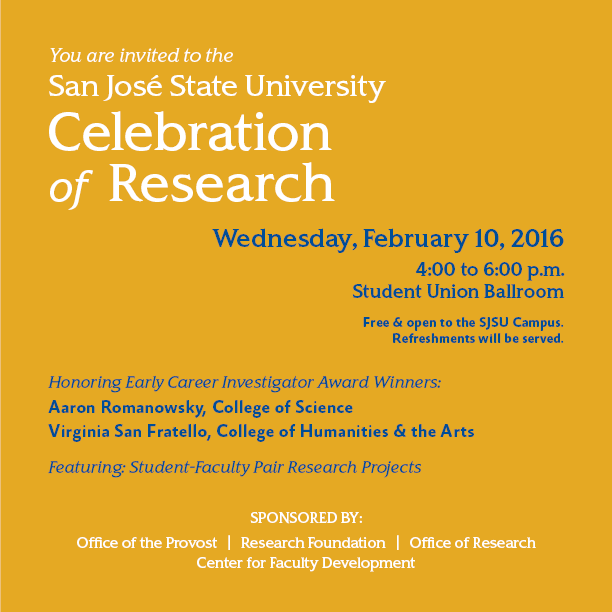 Students who competed in the 2015 CSU Research Competition will also be recognized at the event. Light refreshments will be served. 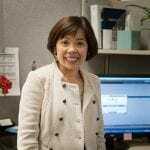 The Celebration of Research is sponsored by the Office of the Provost, SJSU Research Foundation, the Office of Research and the Center for Faculty Development.